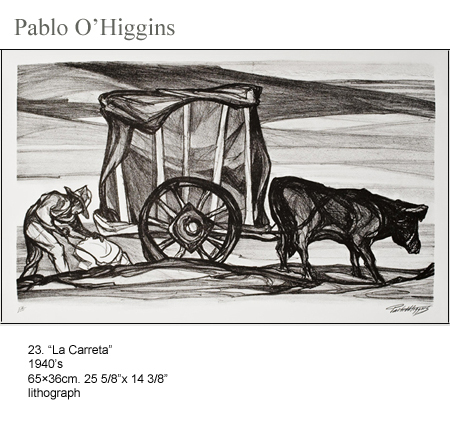 Pablo O’Higgins was born in Salt Lake City, Utah, USA. Not well known in the United States, his native country, he has never had the well deserved recognition there. Some writers do not consider him well known even in Mexico, even though his Mexican citizenship was given to him by Presidential Decree. Pablo was a great artist who never looked for the fame and glamour that many artists look for. He was an excellent artist, with a great sensibility for the problems people face in everyday life. His sensibility is beyond doubt. He painted life as it was. His lithograph representing the life of the sugarcane workers which he painted in Hawaii when this crop was produced there, is proof of this talent. Pablo O’Higgins arrived in Mexico City in 1926. Why he chose Mexico is a good story. He was already a good piano player who had given recitals and concerts, from an early age, and who could have had a very successful career in the USA when read about Diego Rivera. The master muralist was working there as an artist. He wrote to Diego indicating to him his desire to work under him. Diego welcomed him, not realizing he was acquiring a talented and very sensitive artist. O’Higgins actually told his father he didn’t want to study anymore. When his father asked him why, Pablo replied that like many other young Americans, he wanted to work to save money, in order to be able study with Diego Rivera. His father did not allow him to waste time working and gave him $100 dollars. That was all the cash he had in hand when he left for Mexico. That was all the financial support his father ever gave him. In Mexico his career took off. He painted the people he respected… the ordinary, hard-working Mexican campesinos and workers, people he called the “Real Mexicans”.